The man’s family reports he is now paralyzed, and suffered neurological and vision damage. He is also breathing through a ventilator. He will need extensive physical therapy to eat, walk, write again. The man was supposed to be getting married in August, but due to his injuries, that is on hold. Click here to read more on this story. What Is A Coral Snake? Coral snakes are not vipers, but are related to mambas and cobras. Coral snakes in North America are considered “New World” coral snakes and . There are over 65 species of New World coral snakes. The most common are the Eastern Coral Snake (Micrurus fulvius) Texas Coral Snake (Micrurus tener), and the Arizona Coral Snake (Micruroides euryxanthus). Coral Snakes are known for their red, black, and yellow stripes. Most coral snake species are small, averaging around 3 feet in length. Coral snakes are found in primarily in the southeast United States from North Carolina to Arizona. They are very elusive and spend the majority of their time underground or under the cover of leaves and other debris. Coral snakes eat smaller snakes, lizards, frogs, birds, and small rodents. Do Coral Snakes Really Bite? Coral snakes are not aggressive and typically do not bite. Coral snake bites account for less than 1% of all snake bites in the United States. Coral Snake fangs are also relatively small and not very efficient. Unlike most snakes that bite and then let go, coral snakes tend to hold on to their victim and “chew” to help the fangs pierce and deliver the venom. What Makes A Coral Snake So Dangerous? New World Coral Snakes have one of the most potent venoms of any snake in North America. The venom of a coral snake is an extremely powerful neurotoxin that causes paralysis, particularly of the breathing muscles. This requires mechanical/artificial respiration. 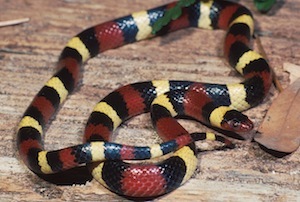 Respiratory and cardiac failure can occur within just a few hours of a coral snake bite. How Do You Treat A Coral Snake Bite? The only way to treat a coral snake bite is to get to a hospital immediately. They will start giving large doses of antivenom. They will monitor the patient’s condition very closely watching particularly for signs of cardiac or respiratory failure. If any signs of either are observed, the patient will most likely be placed on a ventilator. Is There A Shortage of Coral Snake Antivenom? As of 2012, the cost to produce and maintain the coral snake antivenom was so high and the need for it was so low that it was no longer being produced. The antivenom Coralmyn was produced by a company owned by Pfizer. Pfizer announced it would cost $5-$10 million dollars to develop and produce a synthetic version. Foreign pharmaceutical companies have produced their own coral snake antivenom, but unfortunately the cost to license them in the United States has delayed its availability. What Is The Difference Between A Coral Snake & A King Snake? The biggest difference is that coral snakes are venomous and king snakes are not. King snakes kill their prey by constricting them. King snakes typically reach lengths up to 6’. Both coral snakes and king snakes feed on frogs, lizards, rodents, and other snakes.